Complex material handling systems that integrate and control conveyors, scanners, labelers, checkweigh scales, photo eyes, shipping sorters and many related devices have industrial control cabinets containing hundreds of components and thousands of wires. Therefore, a properly designed cabinet is fully tested prior to shipment ensuring delays are avoided. 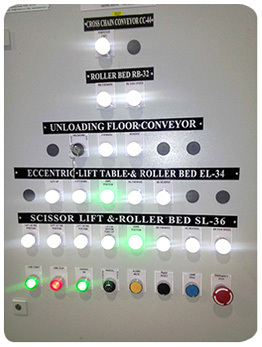 PLC programs and HMI Touchscreens mounted to the cabinet can also be programmed and tested in advance of shipping instead of in the field; further proving TriFactor delivers a wonderful advantage when it comes to a material handling electrical control system startup being done properly with minimal delays.